I've seen a couple of people myself included post asking where the hell this thing was located so I figured since I found it I'd show the way. For those that may be curious the reason for changing your mechanical relay out with an after market electrical relay is to keep the stock blink rate on your signals after changing from standard bulbs to LED's. I haven't tested it with the Raider yet, but I know that when I changed out JUST the rear flashers on my R6 my blink rate went fast because the drop in current draw made my stock relay think that I had blown bulbs so it went into it's default "trouble blink rate", when I then changed the front out they wouldn't blink at all because the current draw was too low to even activate it. So long story short I would suggest that anyone looking to LED their turn signals spend the 15 bucks and get an "electric" flash relay. Now the where to find this damn thing. As with all electrical maintenance I HIGHLY suggest disconnecting the battery before unplugging things. 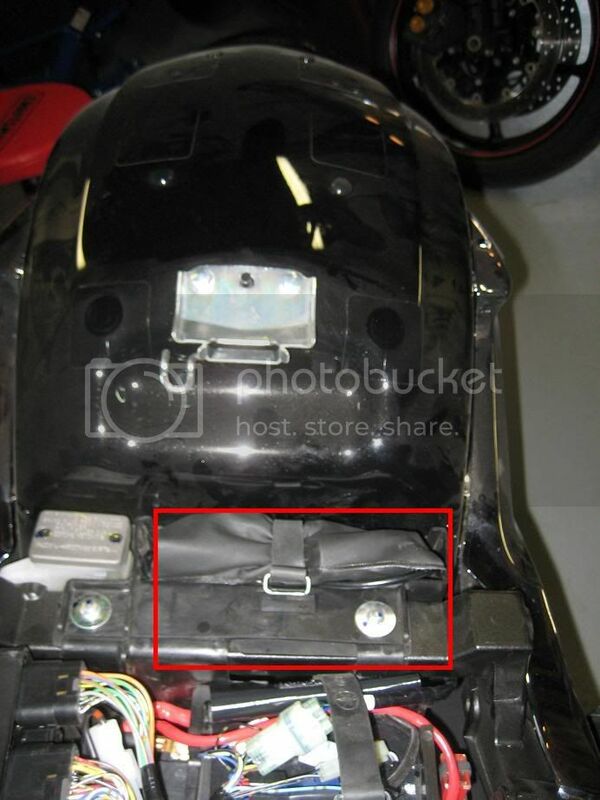 Your flash relay is going to be located under the plastic holder for the tool bag on the left side of the motorcycle. 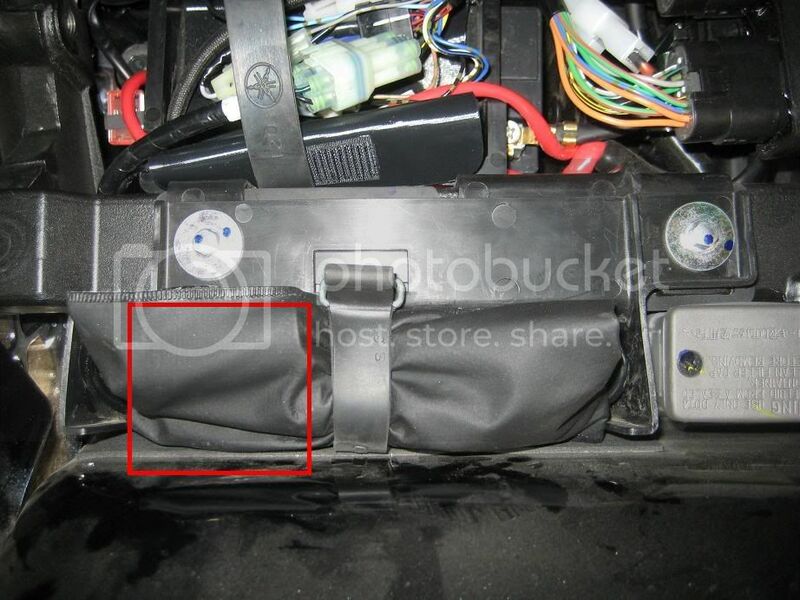 I didn't get a picture of it but when you remove it there is a metal bracket connected to the fender that makes reaching your hand down in there impossible. At this point I realized I was going to have to remove the fender in order to get into that rear end space. I located the plug for all rear connections and unplugged it. 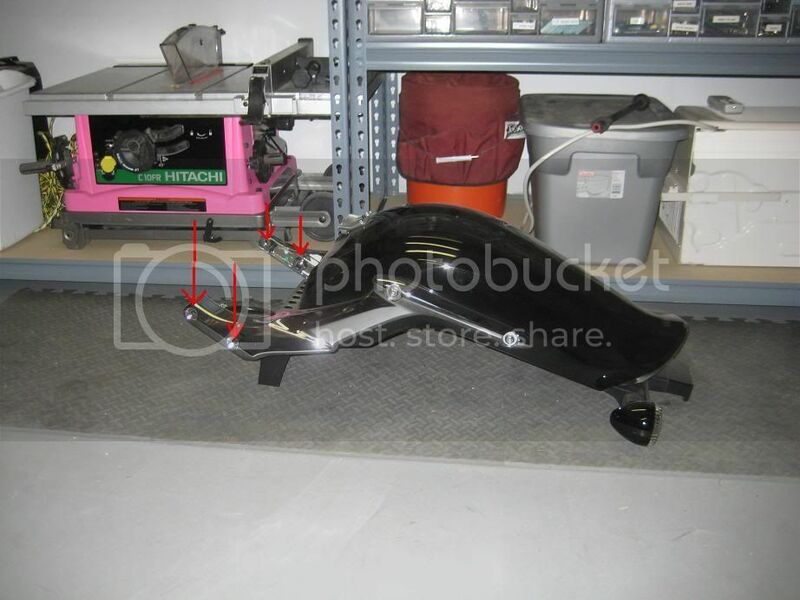 I then removed the front four bolts (two per side) that hold the fender to the frame and removed the fender. 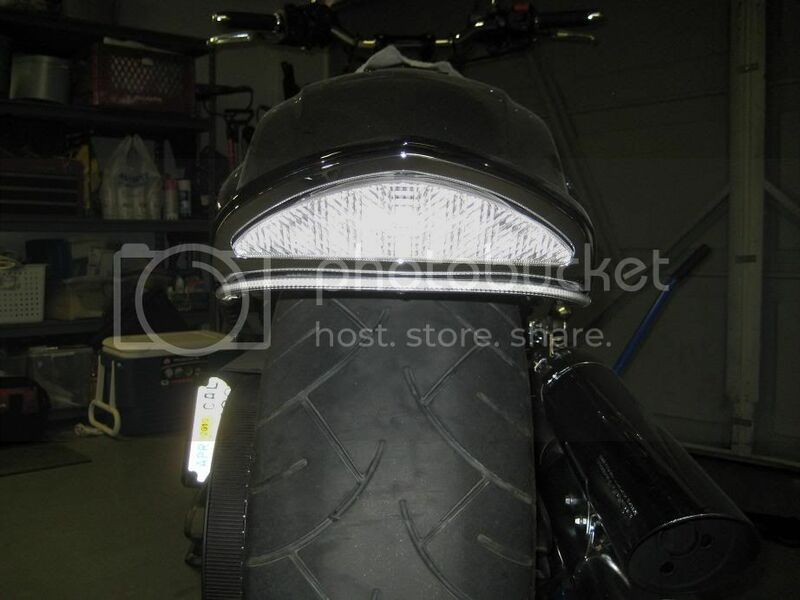 Leaving the back of the bike to look like this. 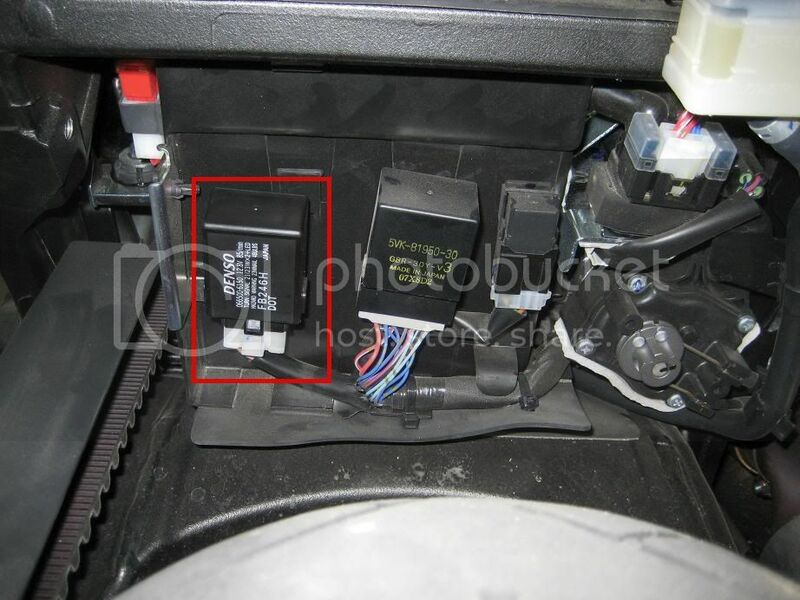 The arrow shows the location of your relay. Now you can get in an get that little bugger out. 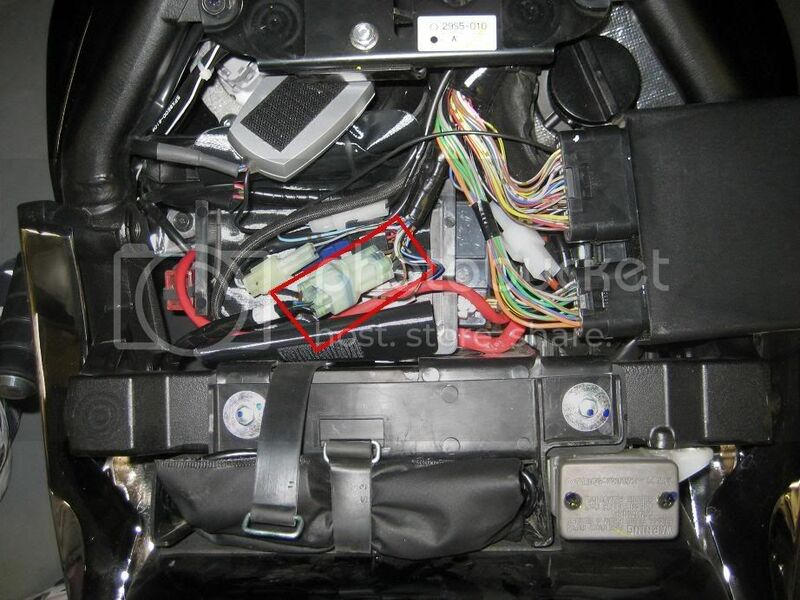 From here I followed the directions given by the custom dynamics website on how to run the wires for a Yamaha cruiser for their ELFR DOT flasher http://www.customdynamics.com/yamaha_flasher.htm . 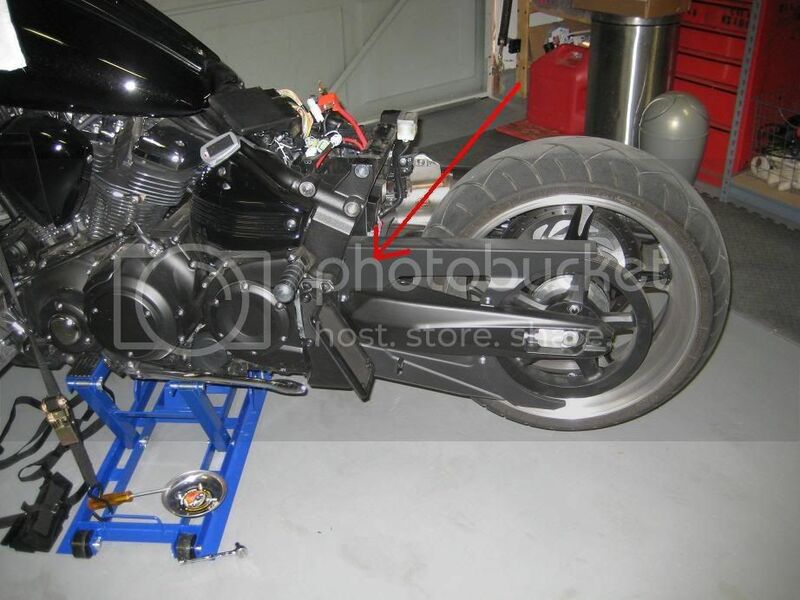 I trimmed the tab on their flasher to fit the rubber mount on the bike and installed it ino the same location as the stock flasher and put everything back together. In all it took about 45 minutes, knowing what I was doing prior to ripping into it probably would have cut that down to 20 or 30 though. 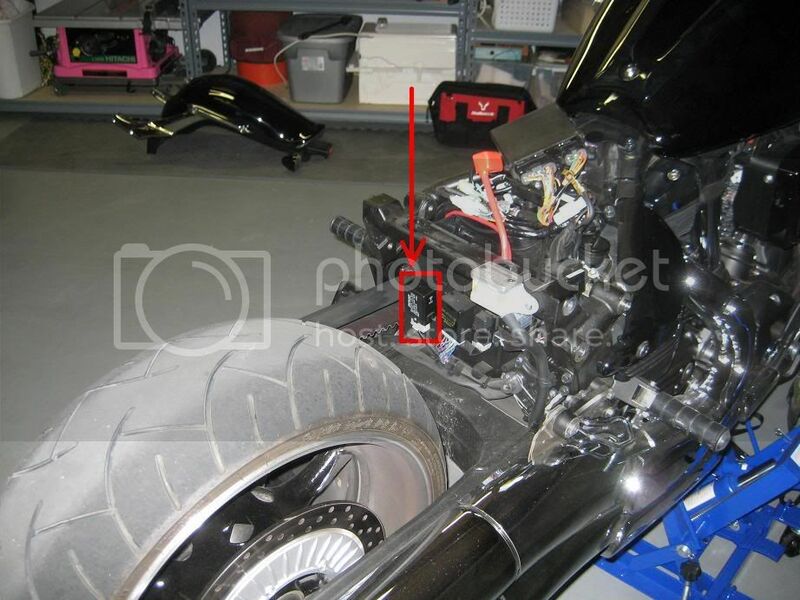 Hopefully this helps someone else, I appologize for the shotty photo's and he dirty bike. Good luck all and keep modding. Thanks for breaking that trail, Leathernuts. Now I have soemthing else to do. Thanks for the photos, I been looking for this thing for awhile and your photos with instructions are good. I wondered if after installing the new relay if your turn signal self cancellation feature was still functional? Again great photos it really helps.